Edward Nicholas was appointed treasurer to Mary II in April 1693. After the Queen&apos;s death in 1694 he continued to pay pensions to her former servants and new pensions granted by the Crown. On 26th June 1703 he was formally appointed Paymaster of the Queen&apos;s Private Pensions and Bounties. In particular he was paymaster for Queen Anne&apos;s Bounty, the fund established by her in 1704 which, till 1947, supplemented poor livings and missionary posts. The Hon. 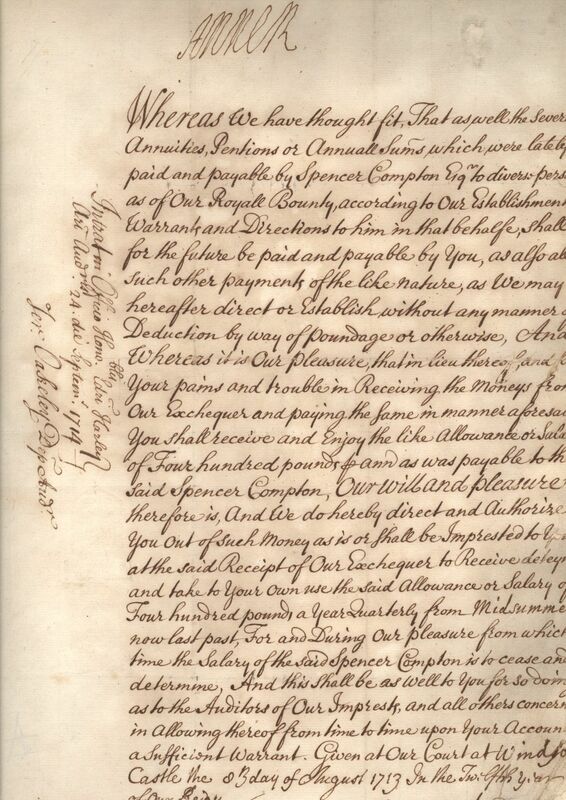 Spencer COMPTON (c. 1673-1743, later 1st Earl of Wilmington and Walpole&apos;s successor as Prime Minister) held the post from 26th April 1707 but vacated it to take a seat in Parliament, and Nicholas, reappointed on 8th August 1713, held the post again till 1715. The office of &apos;Paymaster of Pensions&apos; was abolished in 1782.